At the moment, integrative medicine is just a dream. The two sides of medicine (western vs ‘natural’) oppose each other so vehemently. Traditional doctors and specialists seem to want to push pharmaceuticals, and little else. These medications are supported by scientific studies, usually large scale, but sometimes quite dodgy. Natural or alternative doctors typically avoid pharmaceuticals as if they were the devil, but they have a huge range of things to try – supplements, diet restrictions, naturopathy, acupuncture, energy medicine, homeopathy, chiropractic, Chinese herbal medicine and more. These are usually unsupported or even contradicted by scientific studies, and are often very expensive. Complementary alternative medicine (CAM) are therapies that help, or at least don’t worsen the patient’s condition, while they follow ‘standard’ biomedicine. Although many doctors regard these therapies as little more than placebo. Integrative medicine goes one step further, and should see practitioners on both sides respect each other and work together for the overall health of the patient. They should also include and respect the patient. In practice, this rarely happens. Have you tried this medication? Are you sure you had an allergic reaction to it? Are you sure the headaches are from this and not something else? Other patients are fine with this medication. Have you tried this pain killer? Are you sure you have these side effects? Have you tried a dairy free / gluten free / ketogenic diet? Are you sure you didn’t see any improvements? You shouldn’t be taking medications, so what else have you tried? Homeopathy? Ayuverdic medicine? Did you really feel worse after the treatment? You know, it’s probably just because you are obese. Lose some weight. How, when they can’t even walk because of the pain? Stop eating perhaps? It’s no wonder that patients are not happy with doctors and therapists, and they are frustrated with their patients. Both sets of practitioners constantly disparage each other and their treatments. Although GPs do tend to send people to physiotherapists for muscular problems, alternative practitioners often advocate avoiding GPs completely. Both sets of ‘doctors’ don’t look at the whole body. Even physiotherapists and osteopaths work on a small and limited area when doing manipulative therapy. Both sets disregard, disbelieve or even outright ignore their patients. Medications can be helpful or harmful (or both), as can natural medicine and therapies. Doctors and therapists need to work together. The patient needs to learn about and manage their own health, treatments and therapies. To reach truly integrative medicine, practitioners need to have respect for each other and work together. Plus the patient must both respect and be respected by their practitioners. Until then, it’s up to us as patients, to do the integration ourselves. I have had to remind myself of this, especially after the last year or two. Each day is a chance to experiment and observe to find the medicines and therapies that work. Sometimes our experiments will fail, occasionally spectacularly. Sometimes something will help enormously. Our changing circumstances and bodies will mean that treatments will have to change too. So, we should never stop experimenting, observing, or actively working on our health. Note to self – even when it hurts so much. I had a lot of non-working downtime in which to recover from the operation and seek out answers for other problems that flared. Teaching was not feasible, with the commute, hours standing, a lot of preparation, and a fixed schedule that has no wiggle-room for fluctuating health. I was happy to pick up a new photography contract, and sold over 90 photos to fulfill requests. Happily, this project is still chugging along nicely. I’ve drafted ten group project exercises for language classes, a la “What if you won a medieval village?”. I need to write a few more before sending them out to business and conversational English teachers for testing. It’s not a finished project, but I’m proud of the progress I made. Although learning a language is really not a project with an end, I made huge progress with my German, thanks to the hospital stay and doctors visits. I’m much more comfortable chatting to people both in person and on the phone now. I must always be learning or studying something, in addition to a language. Having something to keep my mind busy was a must for the recovery time. Ramit Sethi’s Success Triggers course, to combat my procrastination tendencies and build better habits, gave me many insights into how I work, and what holds me back. I revisit this course and the exercises regularly. Jeff Goins’ Intentional Blogging got me writing (if not publishing) more regularly, focusing on more helpful topics. I can highly recommend both courses, both as a prompt to get moving on projects, writing or otherwise, and to help you analyse your own patterns and habit and make them better. As a child, I read through libraries of books. I was always reading, at school, at home, at night when I was sleeping. But that dropped off. Last year, I set a challenge to read at least 20 books, and I succeeded! GoodReads tracked the books I read in 2015. Cookbooks count right? Other ‘projects’ like piano, cross stitching, cooking/baking and even gardening had to be put on hold because of ganglion and inflammation that happened after it was in a bad position during my operation in February. Half-way through 2015 I decided to pick up crochet. I had a cheap bamboo hook and some cheap cotton I had picked up in a 100 yen store when in Japan, and hadn’t done anything with them for over four years. When my wrist got a bit of mobility back after a short course of cortisone, I thought crochet might be a good therapy, gentle movement encouraging blood flow and healing. I was right! As long as I didn’t crochet all day long. 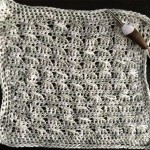 Starting out – I needed to learn the basic stitches, and to follow patterns. 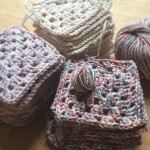 So my first projects were dish cloths for the kitchen and face washers for the bathroom. 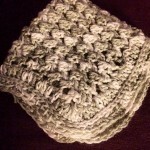 I tried a bath puff, but that absolutely didn’t work, so I let it dry, frogged it (pulled the wool out), and turned it into another dish cloth. At this point, I realised I was having fun with crochet. So I invested in nicer wool and some hooks that promised to be easier to hold than the straight bamboo for people with rheumatism or other hand/finger problems. The Addi Swing crochet hooks have been a fabulous investment for me. I have much less pain and tiredness as I don’t hold as much tension in the fingers when I use the swing hooks. Although, if I hook the whole day, I can still easily develop tendinitis. 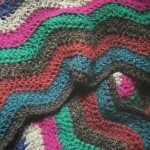 Moderation in everything, including crochet! 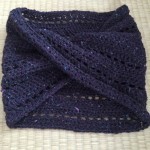 A möbius cowl with simple stitches with a dark purple wool/angora tweed aran. 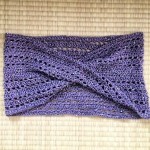 I was intimidated by the twist möbius, but in fact, it’s the best thing for someone who doesn’t count consistently – you just stitch around and around, no counting past the first couple of rows. It was good not to have to worry about the edges not being even. 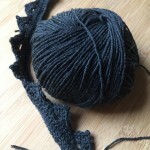 The wool felt a bit scratchy when finished, but after wearing for a week or so, became gorgeously warm and soft. Next was a basic triangular shawl, using merino sock wool. The colours looked awesome when in the balls of wool – purple is one of my favourites. Unfortunately, the patches of black and white joined across several rows, so that when finished, it makes the one wearing it look like a Milka cow – purple, with black and white spots. It’s lovely and warm, so I’m happy to wear it around the house. But next time, I’ll use this colourway for socks. I felt confident enough to start on presents for mum – another möbius cowl, but this time with a sequin yarn. Not pleasant to stitch with, but I was happy with how it turned out. Although, mum is convinced the colour is brown and not purple – it’s purple I swear! 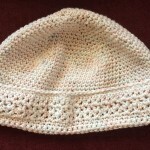 Then a couple of hats – a chemo cap for winter for my mum, and a more summery sun hat with the same cotton yarn and a new stitch learnt. 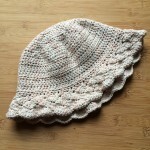 Unfortunately, I’ve discovered that hats are difficult – it’s easy to make a hat that doesn’t fit. These will probably be sent back to me (from Australia!) 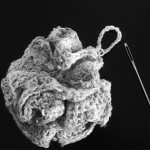 to be frogged and turned into dishcloths. If I make hats in future, they will be floppy, not at all fitted. As the weather became cooler, I started wearing my original möbius cowl full time, so decided it was time to make another möbius cowl. 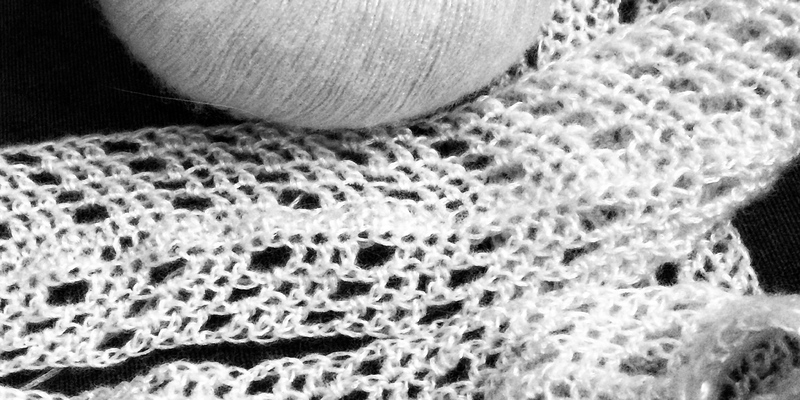 This time with a softer yarn, and not following any real pattern, with a couple of rows of the cable stitch I learnt for my favourite face washer above. It looks like I’m addicted to möbius cowls! Inspired by Michael Nobbs from Sustainably Creative and his granny square blanket, done in 20 minute blocks of time, I started a summer blanket with a collection of colourful cottons. 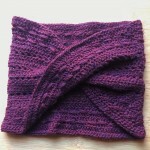 Attic24’s neat ripple design for a warmer blanket, using a chunky merino/alpaca/yak wool mixture in dark jewel tones. Venetian cowl with a lighter weight merino and Celtic knotwork buttons. Another möbius cowl for mum, following no particular pattern. This time with a very light weight summer wool. Finished in January 2016, before the Australian summer ends. 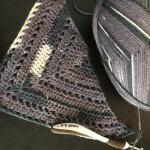 If you want to follow my progress, peek at my unfinished projects, I’m on ravelry as LearnedWords. What did you finish in 2015? I’m battling several chronic illnesses and have very limited energy, lots of pain, patchy concentration, and operations/hospital stays to recover from. Looking back at the various things I finish or goals I reach each year means I feel positive and accomplished. This, in turn, helps lighten or prevent depression that so often partners with chronic illness. What projects did you finish in 2015? 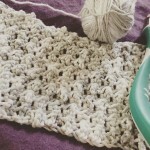 What helps or encourages you to finish projects? Fibromyalgia is considered to be a sensitization problem with the central nervous system, caused by our neurochemicals being out of balance. This means the brain increases our pain response and doesn’t switch it off when the source of the pain is reduced or disappears. Some people are more likely to develop fibromyalgia than others – there is likely a genetic component that predisposes us to develop it. Until recently, before the brain-nerve response to pain and our unbalanced neurochemicals were discovered, several other illnesses were thought to be secondary symptoms of fibromyalgia, because they were commonly seen together. These other illnesses are co-morbid – they co-exist with fibromyalgia. To make diagnosis more difficult, the symptoms of these illnesses overlap significantly. Many people have the other illness first, especially when it causes chronic pain. When the brain is sensitized by the chronic pain, fibromyalgia can develop. People with fibromyalgia are 2-7 times more likely to have at least one co-morbid illness from the list below. Bowel pain, alternating constipation and diarrhea are the defining features of IBS. These are clearly not symptoms of fibromyalgia, and doctors can easily tell these diseases apart. Up to 60% of IBS sufferers have fibromyalgia as well, probably because the chronic pain of IBS triggers the development of fibromyalgia. Rheumatic diseases, including rheumatoid arthritis, polymyalgia rheumatica, lupus and others, almost always have inflammation, and inflammation is not a symptom of fibromyalgia. Because these diseases cause chronic pain and disturb sleep (causing an imbalance in neurochemicals), people who are genetically predisposed to developing fibromyalgia, will develop it alongside their rheumatic disease. Up to 30% of rheumatism patients have fibromyalgia as well. Corticosteriod medications typically improve rheumatic illnesses, bringing the generalised inflammation under control, but they do not reduce fibromyalgia symptoms. Costochondritis can develop after an injury or viral chest infection and can stick around for a long time. It’s an inflammatory condition, that causes pain when pressing on the sternum and around the ribs. Costochondritis is sometimes found together with fibromyalgia, but it is not yet well understood. There is a significant overlap in restless leg syndrome sufferers and fibromyalgia, but the link is not well understood yet. Myofascial pain syndrome and fibromyalgia are so similar that doctors can rarely differentiate. Plus they commonly occur together. Fibromyalgia causes widespread areas of pain, with many tender points, which change location over time. Myofascial pain syndrome is caused by trigger points in individual muscles, and these don’t change location. Trigger points are found with tight sections of a muscle, but tender points are found also outside these taut sections. You can generally feel the difference between the lumpiness of a trigger point (with referred pain), and the smoothness of a tender point (where pain is only at the tender point). Some doctors believe that myofascial pain syndrome is a focal form of fibromyalgia. If you are in pain all the time, you are likely to develop depression and anxiety. Other illnesses that cause chronic pain also commonly cause depression. Fibromyalgia sufferers have the added bonus of our neurochemicals being unbalanced – those same neurochemicals control our moods. Trauma survivors who develop PTSD are also very likely to develop fibromyalgia. Up to 70% of fibromyalgia sufferers are reported to have some form of major depression or anxiety during their life. When you are sick or in pain, you typically don’t sleep well. Fibromyalgia’s unbalanced neurochemicals make that worse – these neurochemicals control our sleep-wake cycles. A bad night of sleep results in even more unbalanced neurochemicals, and a stronger sensitization of the pain response. That’s why it’s most important for us to do everything possible to get enough quality sleep. Lack of quality sleep is the top culprit that makes fibromyalgia pain worse for me. The same neurochemicals that are out of balance in fibromyalgia patients can cause chronic headaches and migraines, so there is no real surprise that these illnesses often co-exist. Unfortunately, there is not much research into patients that suffer both migraines and fibromyalgia. I have ongoing troubles with this – sinus infections, sore throats, light and temperature sensitivities, light fever, enlarged lymph nodes. When blood tests and sinus exams could not find anything, these were put down to being a symptom of fibromyalgia. But current understanding suggests they are a separate problem, which may be related to chronic fatigue syndrome. The defining feature of CFS is the ongoing exhaustion, not usually a symptom of fibromyalgia alone. All the other symptoms overlap – generalized pain, headaches and sleep problems. CFS/ME is typically triggered by a long flu-like viral infection. Up to 70% of CFS sufferers may also have fibromyalgia – they meet the current criteria for diagnosis. People in pain commonly clench their teeth together, and can easily develop bruxism (teeth grinding) and TMJ problems. This can often lead to headaches and earaches. This is perhaps a secondary problem to fibromyalgia or another chronic pain illness, as it is generally a response to chronic pain. When so many illnesses are co-morbid with fibromyalgia, it suggests there is an underlying problem. Perhaps it is the unbalanced neurochemicals, a genetic component, central sensitization, or another physical problem. Developing treatments that target these underlying problems will lead to better understanding of all of these diseases. What illnesses are co-morbid with your fibromyalgia? I’ve collected IBS, costochondritis, migraines/headaches, endometriosis, TMJ, PTSD, insomnia, I had CFS in the past, and am currently being investigated for rheumatism, another viral infection and interstitial cystitis. So many other illnesses with fibromyalgia to deal with. What illnesses co-exist with your fibromyalgia? My health has always been poor. I had constant bladder infections (UTIs), bowel problems, migraines, loads of fevers, joint/foot pain, regular bronchitis, shingles, asthma … quite the sickly kid. Most doctors have said most of my illnesses were a direct result of the 14 years of daily sexual and emotional abuse by my father, starting from the time I was born. Unfortunately, this meant I developed several chronic illnesses before I was a teen. I got known as the ‘sick kid’, the one with the permanent dog-cough. Told I was lazy and making it all up for attention. Throughout my childhood, I felt that illnesses were what defined me. Life was only about the illnesses. They stopped me from doing everything I enjoyed, and even spending time with friends. An allergic reaction as a young teen, to a bronchitis medication I’d taken so many times before, was the trigger to learn about how each of my illnesses developed, and how they interacted with each other. Before then, I’d just accepted that I was always the sick kid. That doctors and parents were the experts. They knew what was best for me. Researching each illness for myself, sent me scurrying after threads of treatments, therapies that might help. I got a better overview and understanding than the specialist doctors or dismissive family. Once my curiosity was sparked, I saw patterns, pulled common themes together, and experimented. I discovered some things that helped, and what made symptoms so much worse. I loved puzzling this tangle out. As I’ve tracked and analyzed my illness history, I’ve found many great ways to manage symptoms. That lets me focus on the things I love. Photography, sewing, crafting, friends, gaming, gardening, cooking, music, writing, traveling, languages, teaching … I weave the things I enjoy around my symptoms, albeit sometimes at a reduced capacity to ‘normal’ ‘healthy’ people. I no longer let my illnesses rule my moods. By knowing how my symptoms come and go, I can focus on my hobbies and work, and enjoy my life. At least until something new turns up. Then I get to talk to loads of medical professionals again, try out different treatments and find a new set of things to help me. It keeps life interesting and, in a strange way, that is enjoyable too. endometriosis, but at least the severe adenomyosis is gone after my hysterectomy. fibromyalgia, with secondary symptoms of costochondritis, sciatica, IBS, bruxism, migraines, sinusitis, Raynaud’s syndrome, and dyshidrotic eczema. a duplex renal system (doubled kidney), and impaired kidney function. chronic Post Traumatic Stress Disorder (cPTSD). new rheumatological symptoms, under the umbrella of synovitis. Cells that normally form and shed inside the uterus lining grow elsewhere. It acts like a cancer. Endometriosis affects 1 in 10 women, and is typically horrifically painful each month – they are bleeding internally! The gold standard for ‘managing’ this disease is surgical removal of the cells. But even surgery doesn’t treat the underlying cause, and medications only try to slow the growth. If endometriosis is ignored, it can deeply invade the uterus muscle and cause adenomyosis. This causes extremely heavy monthly bleeding, that goes on for far too long (a surgeon once said it was “like trying to spit through a mouthful of marbles”). The fatigue, bloating and pain are dreadful. This can be ‘cured’ by removing the uterus – my recent hysterectomy has made my tummy much happier! An umbrella ‘syndrome’ – no common symptom that everyone has, no common treatment, and no one knows how it works. The main symptoms are extreme pain and fatigue. It’s been theorized that the brain in fibromyalgia sufferers becomes sensitized to pain, and isn’t able to shut the sensations off, even when the cause has disappeared. Most of my soft-tissue and inflammation problems were lumped into this diagnosis, because the doctors don’t know why else I would have the symptoms. Treatments and medications simply try to help reduce the impact of the pain, inflammation, fatigue, insomnia and brain fog. This isn’t the same as kidney disease, and results from chronic infections and use of NSAIDs (anti-inflammatory medications). These make your kidneys look like tiny little mice have nibbled away at the edges, leaving the kidneys all lumpy. 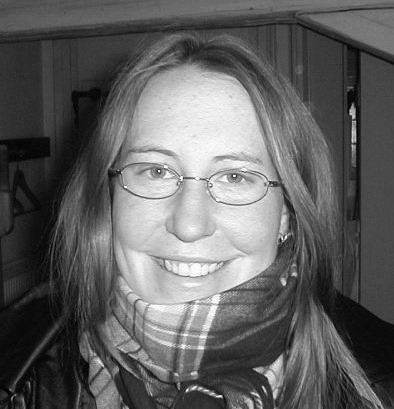 My left was a bit special to begin with, doubled kidneys are a reasonably common birth ‘defect’. Unfortunately, through the damage sustained during childhood, I’m now not allowed to take NSAIDs. Sustained child abuse causes cPTSD, a different beast to the trauma from a single event that causes PTSD. Of course, following on from this is anxiety, panic attacks, and deep depression. Sadly, this heightens the pain and fatigue, causing nasty loops with fibromyalgia and endometriosis. This is an interesting beast, and one I really don’t understand yet, having only been recently diagnosed. It’s an initial symptom to a number of different rheumatic diseases, which either cycle between active and passive or progressively worsen. Do you know why and how your illness developed? How does knowing this help you in your day-to-day life? Please do share your stories! Chronic illness isn’t as constant as you might imagine. There are ebbs and flows, ups and downs. It’s so easy and tempting to get your hopes up on the good days, desperately hoping that this is the end of the pain, especially when you have a run of good days. Only to have them tragically dashed when a bad one arrives. This depressing cycle repeats itself, not just for the one with the chronic condition, but also carers and loved ones. I can only speak as one who has several long term illnesses, 25 years or more for some of the conditions. I’ve often felt my body is at war, never wanting me to be comfortable or happy. A few times, symptoms have receded and given me hope that I could return to a ‘normal’ life, but alas not. If you can’t stop it, what can help lessen the impact? What can make the good times even better? I try to take each day as it happens. Something that took many years to learn, and I still rail against the bad periods. If I wake up on a high pain day, I let tasks slide, say no to requests (where reasonable), and focus on self-care. Very occasionally, pushing through to enjoy an important event or to teach a class. I’m getting better at not beating myself up when I miss out on events, or cause more pain if I decide to do something. Focusing on just the day ahead, not planning into the future (who knows how you’ll be at that time), and not pining after the better periods in the past, reduces self-beating. In the last few months, I’ve found meditation to be a great trainer. When the inevitable future worries or past longings bog me down, I take a few minutes to sit, breathe and focus on my body, as it is right now. Although I’m not good at it, I let those thoughts float away like clouds in the sky, or ripples on water. When you focus on a good day, it’s even more enjoyable. I have a bunch of low-energy things I enjoy. Reading fiction, listening to music, drinking a cup of good quality tea or coffee, eating a delicious truffle chocolate, gaming with feet up in bed or on the couch. Some other enjoyable little things are actually therapeutic: soaking my hands or feet in hot salty water; steaming my head with eucalyptus or lavender oil; relaxing, eyes closed, with a heat pack on my neck or back; taking a long, hot shower. I used to have some more crafty things like drawing, stitching, baking or preserving, but sadly I’m having trouble with one of my wrists. Having at least one good thing to look back on at the end of a day makes the bad days seem less awful, and the good days better! Being mindful of yourself, what you are doing and your surroundings, helps to ground you in the present. Just don’t start beating yourself up for the things you find difficult! I’ve always an absent-minded mega-kutz, injuring myself on all sorts of things. Jamming finger joints when trying to open doors too quickly, dislocating toes while walking on carpet (! ), falling over on uneven ground, breaking toes by misjudging corners, bruising myself left, right and center. And I cursed myself every time I was clumsy. Moving mindfully has reduced ankle and knee pain as I pay attention to how and where I step. Burning myself less often on hot things from the oven or stove. Avoiding sharp corners. Lifting things carefully. Of course, it’s difficult, especially with a new symptom/injury. The number of times I’ve recently picked up a bottle or the kettle, or tried to open a jar, and made my poor wrist scream for mercy, shows I need to work on this. But I’m not berating myself for being forgetful as much as I once did. Or, at least, I’m trying not to! It’s awfully difficult to be grateful for anything when you are hiding in a dark room, head pounding, stomach churning, fighting another dreadful migraine. On those days, I can only find the smallest things – comfy flannelette sheets, good loose tea, purring cats, heat packs, lavender hand cream, even just the darkened and quiet room. Ending or even starting the day being grateful for a few things, helps remind myself to focus on the present, enjoy the little things, and be mindful in how I move. Bring present, mindful, grateful and finding small things to enjoy, on good days and bad have helped me better accept my chronic conditions, on most days. What things do you do to reduce the burden of chronic illness? For most of my life, I’ve been managing health problems, day by day. Both physical and mental. And I’ve been doing a relatively good job, despite worsening illnesses. Hi! 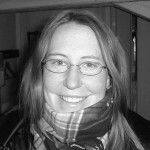 My name’s Kymberly Fergusson, and I’m a chronic pain and illness sufferer (manager) and childhood abuse survivor. Just like everyone, I have bad days and good ones. This blog is my way of sharing how I manage to keep going, day by day. From the time when I was born, until I was 14, I suffered daily sexual, physical and emotional abuse from my father. It left me with severe post traumatic stress and a variety of health problems. I started my journey out of the abuse situation at 14 by seeing a social worker, all by myself. Then I got myself fostered and moved out of the toxic family situation at age 17, to focus on completing school. Throughout my teens and later, I’ve been a regular visitor to doctors and specialists, trying to diagnose the huge range of painful physical illnesses that have disrupted my life. The ongoing illnesses I’ve been diagnosed with and have had to learn to manage: recurrent cystitis (age 5 onwards), sciatica (age 11), costochondritis and migraines (14), eczema and severe acne (15), depression and PTSD (17), chronic sinusitis and CFS (19), Moreton’s neuromas, Raynaud’s syndrome, fibromyalgia, neuralgia and irritable bowel syndrome (22), bruxism, duplex left kidney and damaged kidneys (23), endometriosis (24), adenomyosis (28), endometriosis of the bowel (36), meniscus tear (37), cervical spine injury to C2 (38), plus a host of more transient illnesses and allergies. I’ve had 5 laparoscopies for endometriosis, 3 chemically induced menopauses, and tried hundreds of medications and therapies. Anti-cancer medications like Zolodex are not fun, let me tell you! Over time, I’ve been forced to reduce my working hours to almost nothing as the diseases have worsened. It’s easy to beat yourself over the head with the past. With the people who didn’t take you seriously – family, doctors, specialists. With the therapies, operations, treatments and medications that didn’t work. With the jobs you have had to leave. The work left undone. The appointments missed. The people you let down. The time you couldn’t spend doing things you enjoy. But it doesn’t help you deal with the situation right now. It’s taken me a long time to get to this point, and I still do beat myself up. Less often than I did. Right now, I am focusing on getting rid of the adenomyosis. It has become far too painful to manage with medication (Mirena/Visanne). In February, I will have a hysterectomy. They will clear out any adhesions and endometriosis that have grown back (again) in my pelvis. At the same time, the surgeon will remove the endometriosis that has invaded the bowel. It might be a simple, quick operation, or it may be very complicated, with a bowel resection and colostomy bag. A ‘Kur’, or health retreat, is planned for my recovery. I’m not allowed to work for several months, just in case the operation is complex and to help with recovery. I don’t really know what to expect, from either the operation, or the Kur. I am definitely very anxious. I try to focus on the positives – at least one problem, the adenomyosis, will be gone for good. The Kur will be a good opportunity to improve my mediocre German skills. Once recovered, I’ll be able to lie or let my cats curl up on my belly. I’ll have time to read, study, and do some things I’ve been putting off while putting my energy into teaching. It’s important to focus on now, on the positives, and limit looking back into the past. It gets you through, day by day.